RegTech Associates in collaboration with the FCA will be driving meaningful industry discussions on ‘actionable’ regulatory solutions through collaborations with financial institutions & regulators. 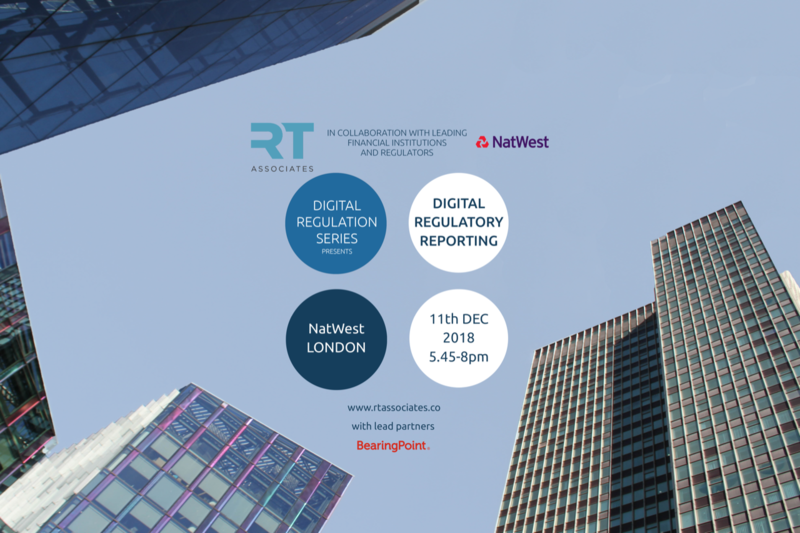 This event is proudly supported by Natwest, London and focusing on Digital Regulatory Reporting. Bearingpoint are our lead partner for the event. NOTE *** This event is free to attend for Financial Institutions. Please register above and we will be in touch with you to confirm your attendance. This evening event is preceded by an industry roundtable continuing our formal collaboration on Digital Regulation with the FCA. In attendance will be The Bank of England, MAS, Barclays, Credit Suisse, HSBC, Nationwide, RBS, Standard Chartered, Santander and the roundtable is hosted by RBS/Natwest. We will be exploring Data Governance, Common Data Models, Reg Reporting as a service and a Roadmap to DRR. We believe the next step is to understand some of the immediate practical implementation challenges for financial institutions in the adoption of digital regulatory reporting and at the same time, develop a longer term vision or end-state for digital regulatory reporting. Our aim is to produce actionable outputs, such as target architectures, approaches and technology maps that can help achieve this end-state and overcome some of the current challenges. The event will be a great opportunity to interact with major UK banks, international banks, asset managers, asset owners, wealth managers, pension funds and regulators. Join the largest independent RegTech community here.